Aero II is a recreation of a Harmony Guitar & Ukulele Company instrument created and issued as a commemorative novelty in the late 1920s and early 1930s in honor of Charles Lindberg's 1927 Transatlantic flight. It’s questionable whether or not the original Aeros were made to honor this historic aeronautic feat or rather a simple marketing ploy by Harmony to capitalize on a lucrative era of plane-themed products. Although marketed as a flying ukulele, and conceptualized as maybe more plane than musical instrument, the Aero II’s shape is more than striking or far-fetched, it’s wave-like design lends to its beautiful acoustics. The unique shape performs well, holds lovely tone and is delightfully fun to play. . The curved frame creates ample resonance with upper sound holes functioning almost as side monitors frequently found on modern instruments, a feature which further enhances Aero II’s sound. The exaggerated and hyper-elongated neck makes the Aero II appear giant, but its overall length is in fact comparable to a soprano. The ideal and most comfortable playing position is achieved by resting the end of the ‘wing’ on an upper leg. The body and neck are composed of Honduran Mahogany. The soundboard is made of Sitka Spruce. The Fretboard is Rosewood. The detailed artwork was silk-screen printed and sealed with lacquer for a smooth and protective finish. The entire instrument is well made, polished and plays well. 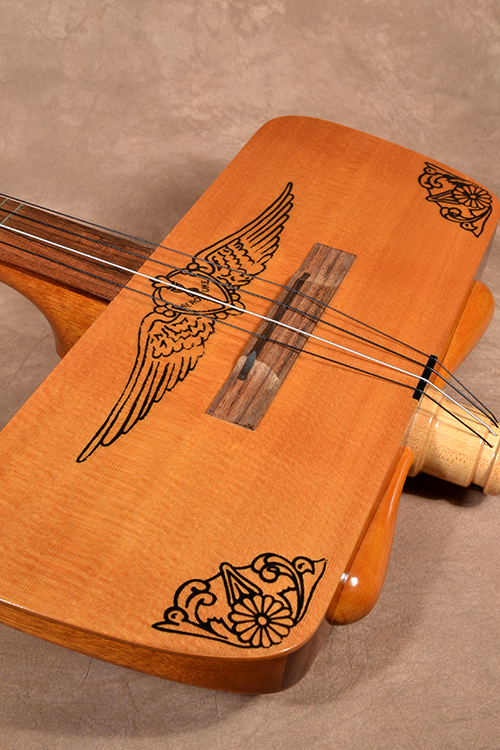 Aero II was inspired by an original, kindly loaned to Pohaku Ukulele by a private collector more than ten years ago. The original was a reference point for building this and two others like it. These reproductions are accurate to the original instrument’s dimensions and materials. Aero II was aside over a decade ago was recently re-discovered in our climate-controlled archives. Aero II is the last Pohaku Aero built and probably will ever be built by us again. Undoubtedly, this is a collector’s item. Due to the unique shape of this ukulele it does NOT come with a hardshell case typically given with all Pohaku ukuleles. It is approx. 26” long and weights about 24 ozs. Price is $1,325 plus sales tax in Calfornia. Shipping is $40 to the mainland U.S.